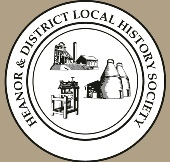 The 2019 Heanor History Calendar is now available. We have yet again held the price to just £3.00. A4 size, there is a different photograph for each month of the year, covering Heanor, Langley, Codnor, Marlpool, Loscoe, and Langley Mill. The calendar can be purchased directly from the Society at any of our meetings - we will also be at the town’s Christmas Fair in December. You can also find it at Frosts on Market Street. If you are not able to pick a copy up yourself, you can order one directly from this site, using PayPal. If you would like to pay by cheque or postal order, or if you want to order multiple copies to be sent to the same address (in which case we will work out a separate postage rate), please use the Contact Us page to send your details - we will return an email with the address to which you should send your order.